Nonsuch park is jointly owned by Surrey County Council and the Boroughs of Sutton and Epsom & Ewell. Photo: Google Street View. The death of a man, whose body was discovered last week behind Nonsuch Park, Epsom, has been cleared of all suspicion by local police. Having originally declared the death “unexplained” and appealing for the public to come forward with information regarding the incident, East Surrey CID have officially ruled out any possibility of foul play. Detective Inspector Jackie Elkins said: “We have received a lot of calls from the public who have given us really useful information to help with our investigation. I would like to thank everybody who has come forward with information. The deceased individual has been formally identified by Surrey Police as a 37-year-old man. 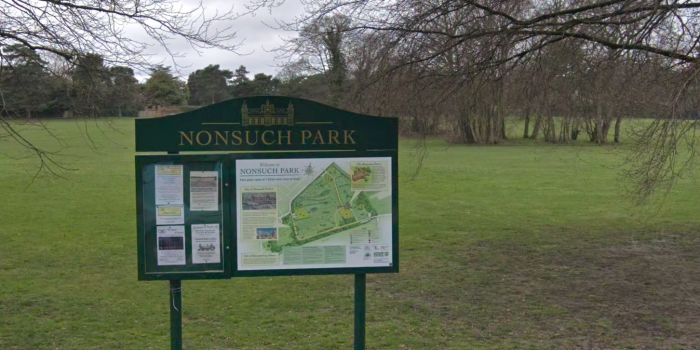 Officers were called to the ‘wooded area’ near Castle Avenue at approximately 3PM on Tuesday January 8 after the body was found, requesting shortly after to speak with anyone who had recently visited the Nonsuch park area. “If you remember seeing anyone in the park recently who may appear to have been sleeping there, or perhaps seemed generally suspicious, please contact us so we can piece together the circumstances surrounding the death,” said Elkins on the day of the discovery. Reports of an incident near Nonsuch first emerged on social media at around 8.15pm on Tuesday evening. The deceased man’s identity and cause of death is still unknown.